Coffee has a long history that goes at least as far back as the thirteenth century. It is believed that began in the Horn of Africa, most likely modern day Ethiopia and spread later to the city of Mocha, a port city coast of modern day Yemen. Many different legends exist on where and when was first recognized the energizing effect of the coffee bean plant. One account involves the Yemenite Sufi mystic Ghothul Akbar Nooruddin. When traveling in Ethiopia, the legend goes, he observed birds of unusual vitality, and, upon trying the berries that the birds had been eating, experienced the same vitality. Other accounts attribute the discovery of coffee to Sheik Abou’l Hasan Schadheli’s disciple, Omar. According to the ancient chronicle (preserved in the Abd-Al-Kadir manuscript), Omar, who was known for his ability to cure the sick through prayer, was once exiled from Mocha to a desert cave near Ousab. Starving, Omar chewed berries from nearby shrubery, but found them to be bitter. He tried roasting the beans to improve the flavor, but they became hard. He then tried boiling them to soften the bean, which resulted in a fragrant brown liquid. Upon drinking the liquid Omar was revitalized and sustained for days. As stories of this “miracle drink” reached Mocha, Omar was asked to return and was made a saint. Another story involves a goat-herd, Kaldi, who, noticing the energizing effects when his flock nibbled on the bright red berries of a certain bush, chewed on the fruit himself. His exhilaration prompted him to bring the berries to a Muslim holy man in a nearby monastery. But the holy man disapproved of their use and threw them into the fire, from which an enticing aroma billowed. The roasted beans were quickly raked from the embers, ground up, and dissolved in hot water, yielding the world’s first cup of coffee. 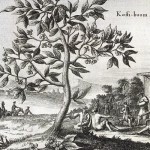 The earliest credible evidence of either coffee drinking or knowledge of the coffee tree appears in the Sufi monasteries of the Yemen in southern Arabia. From Mocha, coffee spread to Egypt and North Africa, and by the 16th century, it had reached the rest of the Middle East, Persia and Turkey. From the Muslim world, coffee drinking spread to Italy, then to the rest of Europe, and coffee plants were transported by the Dutch to the East Indies and to the Americas. 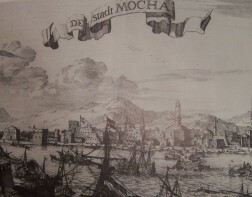 The vibrant trade between Venice and the Muslims in North Africa, Egypt, and the East brought a large variety of African goods, including coffee, to this leading European port. Venetian merchants introduced coffee-drinking to the wealthy in Venice. In this way, coffee was introduced to Europe. The first European coffee house was opened in Venice in 1645. During the following years coffee widespread in many regions in the world, with many coffee houses established in England (1650), Holland (1663), France (1671), Austria (1683) and many other countries where the elite enjoyed the delicious drink. Today Coffee is the world’s most popular beverage, it is possible to find good coffee in every major city, from London to Tokyo; The Nordic Countries consume the most coffee per capita, with Finland typically occupying the top spot with a per-capita consumption in excess of 10 kg per year, closely followed by Norway, Sweden and Denmark. We are drinking more and, more importantly, better coffee.